If you like being outside, then it is important to know how to take care of your skin, especially if its sensitive. The environment can be tough on it because the sun’s rays emit ultraviolet light that damages it, strong winds can burn it, or pollutants can make it dirty. To avoid the ill effects of the great outdoors on your body, pick the best sunscreen for sensitive skin. 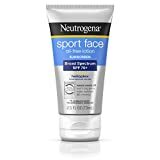 This Neutrogena sunscreen is formulated specifically to protect facial skin. 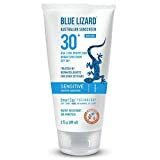 ​The Blue Lizard sunscreen provides broad-spectrum protection for people with sensitive skin. 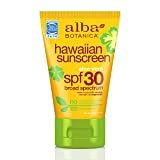 ​This broad spectrum sunblock is SPF 30 and uses natural ingredients to protect skin from sun damage. ​This sunscreen has a matte finish face sunscreen that protects the most sensitive sun from sun damage. ​This face stick can provide everyday protection against the sun's UV rays. ​For overall body protection, the Coppertone Sensitive Skin Lotion is broad spectrum to protect skin from sun damage. It is important to choose the right protection for your skin because the wind, sun, and environment can wreak havoc on it. The UV light from the sun can cause sunburns, which can develop into melanoma or skin cancer. If you have sensitive skin, then it can discolor your skin and make it blotchy. To choose the best sunscreen for sensitive skin, start by selecting the correct sun protection factor, or SPF. The higher the SPF is, the higher amount of protection it offers. However, the differences between them are not that much. For instance, a sunscreen that is SPF 15 provides 93% protection from UVB rays. If it is SPF 30, it provides 97% protection, and SPF 50 is 98%. Dermatologists recommend wearing at least SPF 30 anytime you’re going to be outside. However, it needs to be applied correctly for sunscreen to be effective. It is recommended that you apply the sunscreen about 15 minutes before going outside to allow your skin to absorb the lotion or spray. Don’t be stingy with it, but apply it liberally using about an ounce of a lotion or spray to cover your entire body, including the back of your neck, the shell of your ears and your feet. If you’re going to be exercising or swimming, pick a sports sunscreen because they are made to not wash off from sweat or water. Reapply sunscreen every two hours to ensure your skin has the right amount of protection. Choosing the best sunscreen for sensitive skin involves choosing the best SPF for your skin. First, choose a broad spectrum sun lotion or spray, which means it protects your skin from both UVA and UVB light. Then, pick the SPF that’s appropriate for your skin type. Babies and children usually have sensitive skin, which can easily be irritated by certain chemicals found in most sunscreens and natural shampoo brands. Para-aminobenzoic acid, more commonly known as PABA, and oxybenzone have been known to cause reactions on children’s skin. Read the label of any sunscreen that you buy for your children to ensure they don’t have those chemicals in them. You should avoid parabens and fragrances as well. Pick a sunscreen spray or stick to make it easier to apply to your youngsters. The best sunscreen for sensitive skin should be SPF 50, but make sure to select water resistant ones if they are going to be in a pool. If your skin is sensitive and easily breakouts due to harsh chemicals, try a natural sunscreen. Avoid lotions or sprays with fragrances, alcohol, and oxybenzone because they can all irritate skin. Choose a lotion or cream base to prevent irritations. Acne medications, as well as other prescription drugs, can increase sun sensitivity. It makes it especially important to apply the proper type of sunscreen to prevent sunburns or other damage. Consider SPF 50 sunscreens or sunblocks to protect your body. If you have fair skin, then sun protection is especially important for you. Fair complexed people can burn very easily after just a few minutes in the sun. They should select sun protection that is at least SPF 30 or better. SPF 50 is usually the best choice for them. Older people are also more sensitive to the sun as skin thins with age. Along with a hat to protect the scalp if your hair is thinning, also apply an SPF 30 or 50 sunscreens to keep from burning. Reapply it every two hours if you are going to be outside most of the day. Even though you may have dark skin and do not burn but tan, you still need sun protection. UVA rays can penetrate the thickest layer of skin called the dermis. When this happens, it can damage tissues, like collagen, and cause premature aging. UVB rays cause skin cancers to form, which can affect any skin type. Choose SPF 30 sunscreens to ensure your skin is protected. Along with the right sunscreen, you can also protect skin by wearing a light shirt, a broad-brimmed hat and protect your eyes with sunglasses that reflect UV light. If you wear regular glasses, either buy prescription sunglasses or have your regular lenses tinted to prevent glare and eye damage. To help you choose the best sunscreen for sensitive skin, we’ve rated seven choices for you to consider. When we research products, we give them a star rating to make it easier to find the best ones. The star rating system ranks products from one to five stars, with five being the best products in the category. Along with researching each product, we also read testimonials from customers who have bought and used the sunscreens. Testimonials can tell you what is good about the product or what people didn’t like. This information can make it easier for you to choose the best sunscreen for sensitive skin. First on our list of the best sunscreen for sensitive skin is from Neutrogena. This sunscreen is formulated specifically to protect facial skin. It is the most sensitive skin on your body, and it can age quickly due to sun damage. This sunscreen is SPF 70+, and it provides broad spectrum protection from UVA and UVB light. Since it is a sports sunscreen, it won’t wash off if you sweat or go for a dip in the pool. However, you should reapply it after 80 minutes. Face sunscreens do not clog pores or dry out skin, plus they can sometimes help diminish fine lines and wrinkles. This product is available as one tube or in packs of two or three tubes. ​It is gentle enough to be used on the face and all over your body to prevent sunburns and damage from the elements. ​SPF 30+, as recommended by dermatologists.​You’re not sure about the UV count when you’re outside, just look at the bottle.​This utilizes smart technology, so it turns blue if harmful UVA light is present. The Blue Lizard sunscreen provides broad-spectrum protection for people with sensitive skin. Instead of using chemicals to block UVA and UVB rays, it uses zinc oxide and titanium dioxide, which are both minerals. It doesn't contain parabens or fragrances either. ​This cream gentle enough to be used on the face and all over your body to prevent sunburns and damage from the elements. It is SPF 30+, as recommended by dermatologists. If you’re not sure about the UV count when you’re outside, just look at the bottle.​The utilizes smart technology, so it turns blue if harmful UVA light is present. Non-irritating, ultra-moisturizing formula that's great for soothing sun-exposed skin. These ingredients provide antioxidants, vitamins, and oils that repair and prevent free radical damage. They also help hydrate skin to prevent it from drying out under the hot sun. Even though it's not a sports sunscreen, it is also water resistant. Kiss My Face is suitable for those living a vegan lifestyle, it is cruelty-free, and it doesn’t contain parabens, fragrances, or artificial colors. The packaging is recyclable, so it is an environmentally friendly product. This best sunscreen for sensitive skin has a matte finish face sunscreen that protects the most sensitive sun from sun damage. It uses antioxidants to fight off free radicals that can damage skin and make it appear older. Along with sensitive skin, it can also protect people who have combination or normal skin as well. It has a very light texture, and it is also water resistant for up to 80 minutes. This La Roche-Posay product is SPF 60, and it can reduce sun damage that has already been done to your face. It is both paraben and fragrance-free, so it shouldn’t irritate skin. This face stick can provide everyday protection against the sun's UV rays. Both adults and children can use it, and it is specially formulated for those with highly sensitive skin. It contains ingredients that not only provide broad-spectrum protection, but it keeps skin hydrated, prevents aging, and enhances its appearance. It provides 80 minutes of protection in the water, and it is cruelty-free and reef friendly so that it can be worn anywhere. Some of the ingredients it includes are Vitamin E, avobenzone and oxtinoxate to filter the sun, and beeswax. Children, especially babies and toddlers, have very sensitive skin since it is new. If they are going to be out in the sun, then their skin needs added protection offered by sunscreens like this Alba Botanica lotion. They need a sunscreen without harsh chemicals that can irritate skin. 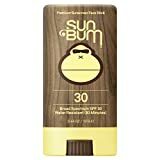 This sunscreen is broad spectrum, SPF 30 and uses natural ingredients like minerals to protect kids’ skin from sun damage, wind burns, and other environmental damage. It contains natural ingredients like aloe, chamomile, and ginkgo Bilboa that soothes sensitive skin with a creamy lotion. Its ingredients are 100% vegetarian, and it doesn't contain parabens, phthalates or synthetic fragrances. In addition, it is cruelty-free, and the lotion is water resistant for up to 80 minutes. 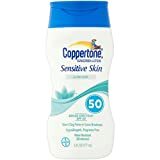 For overall body protection, the Coppertone Sensitive Skin Lotion is broad spectrum to protect skin from sun damage. It has been clinically tested to ensure it can be used on sensitive skin, including those who are prone to Rosacea. It doesn't contain any ingredients that irritate skin, and it won't clog pores so that it can be applied to the face as well as the body. The lotion uses zinc oxide to block sun rays to protect skin against both UVA and UVB light. It doesn’t have dyes, fragrances or oils that can cause breakouts. It is suitable for the entire family to use, from the adults to children six months or older. If you have kids or your skin is sensitive, it is important to buy skincare products without harsh chemicals in them. If a bottle of sunscreen is not marked for being appropriate for sensitive skin, read the label. Most kids or baby sunscreen will be formulated to protect their skin, but make sure it is at least SPF 30+. The best sunscreen for sensitive skin don’t contain synthetic fragrances, alcohol, oxybenzone or other chemicals that can cause irritations. Most sunscreens that are specially formulated for sensitive skin will say so on the front label, but others may be appropriate as well. Read the labels to find out if sunscreens have vegetarian or vegan ingredients as they are made from minerals, vitamins, and botanicals that can soothe, repair and protect sensitive skin. Remember to properly apply the lotions or sprays. Otherwise, they cannot provide as much protection as printed on the label. Also, aid the sunscreen by having your kids wear a brimmed hat, a UV sun shirt, and sunglasses when they are outside, at the pool or the beach. Set the example by wearing a broad-brimmed hat and sunglasses yourself. It is as important to protect your eyes as it is your skin from the sun. Skin cancer, or melanoma, can start developing at a young age, so teenagers and those in their early 20s should also wear sun protection. However, you should expose yourself and your kids to the sun for a few moments a day to allow your body to absorb Vitamin D from the sun. About 10 minutes is enough time to absorb the Vitamin D your body needs to stay healthy.